Home › Latest News › Open Track Day at Dezzi Raceway! Open Track Day at Dezzi Raceway! 04h00 on a beautiful Saturday, morning my alarm goes off and I bounce out of bed ready for action! What day is it? It’s the Harley-Davidson® Durban track day at Dezzi Raceway in Port Shepstone of course! The sun was shining brightly by the time we arrived on track at 05h50 and my club mates and I took full advantage of an empty race track to put in some laps and learn the lay of the land. At the same time brake markers were put down and preparation began in earnest for what promised to be a day filled with loads of laps on gleaming Harley-Davidson® motorcycles. The day did not disappoint in the slightest. 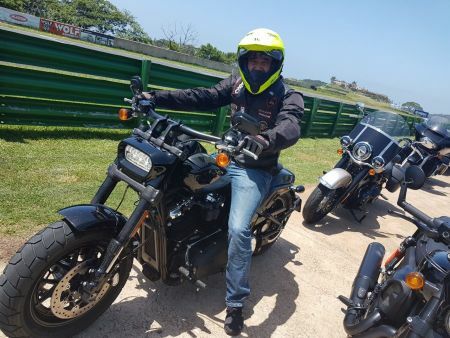 Our lead riders arrived with the rest of the Harley-Davidson® Durban team and our bikes were all lined up and ready to go. Lead rider briefings were done by our resident superbike racer Juan de Wit, who expertly laid out the rules of the day for us all. He then took all the lead riders around the track and let them experience the thrill of riding on a track, which for most of us was a first. We started seeing our first visitors not long after 9am and thanks to our brilliant admin team (Kyran Pratt and Charlotte Marx), entrants were smoothly grouped together and attached to their respective lead riders for briefing. The smiles on their faces upon returning from their three lap tour of the track were priceless. I felt like I was watching little boys and girls that had unwrapped their first Christmas present all day long.Pure unbridled joy and excitement was most certainly the order of the day. As the day progressed, so too did the levels of confidence in our riders. It was great to see how nervous anticipation transformed into confidence and control as the number of laps completed increased. What pleased us most was the fact that not one incident was reported for the day. Our trusty medics were on site all day and thankfully had nothing at all to do, but watch our bikes fly by. Would we do this again? YOU BET!! All the comments received from our participants and lead riders alike have been massively positive and we thank our loyal H.O.G.® members and customers for attending what was a most memorable day indeed.